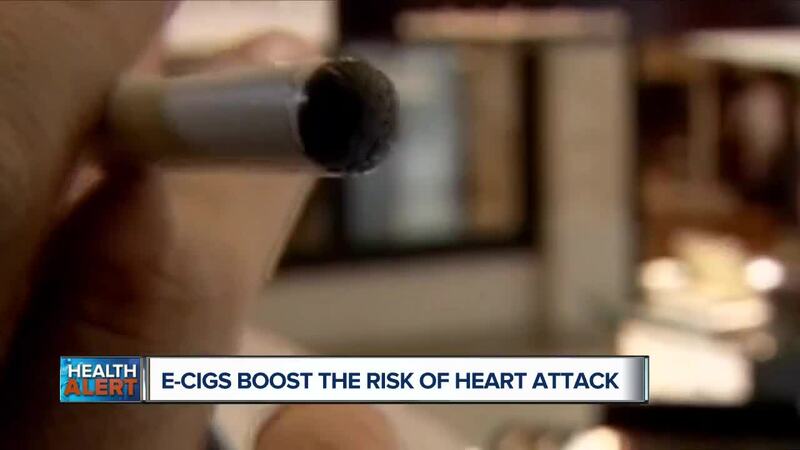 (WXYZ) — E-cigarettes have become quite popular with sales booming here in the US. And when it comes to our health, they’re also boosting the risk of heart attacks. Question: How much does it raise the risk by? I know there are a lot of folks out there that use e-cigarettes because they think it’s cool and trendy. While others see it as a way to quit smoking. But really how safe are these products? Well, I can tell you that when researchers looked at data that compared non-smokers to smokers, they found some frightening numbers. The folks who smoked e-cigarettes on a daily basis had nearly double the odds of a heart attack. And for those who used both traditional cigarettes along with e-cigarettes, the risk was much higher. They had nearly a five-fold increase when it came to a heart attack risk. Question: How can e-cigarettes damage the heart? Well, just like traditional cigarettes, e-cigarettes also contain nicotine. And research shows nicotine not only raises your blood pressure and heart rate, but can also increase cholesterol plaque build-up inside the arteries. And this can clog blood flow that goes to and from your organs. Also, e-cigarettes release ultrafine particles along with other toxins, which can not only damage blood vessels but also help cause blood clotting. And these can all lead to heart disease and heart attack. Question: Can e-cigarettes help people stop smoking? They have not been approved by the FDA as an aid to help someone quit smoking. So far, the studies have been mixed and some have had limitations like small sample size and wide margins of error. And unfortunately, a CDC study found that many adults who are trying e-cigarettes as a way to kick their smoking habit end up using both products. And as I mentioned earlier this really raises the risk of a heart attack by a factor of five. Now nicotine is very addictive, and if you’d like to quit, I’d suggest talking with your doctor who will be glad to help. You’ll need a plan in place that includes ways to manage your cravings along with plenty of loved ones who can help support you. Do you suffer from pain that just won’t go away? If the answer is yes, then you’ll want to join Dr. Nandi, MD this Saturday, February 23, 2019, at 1 pm to watch his all-new episode “Please Make My Pain Go Away”. You’ll hear how three guests faced their own devastating health crisis and how each were able to heal themselves using different techniques. You’ll also learn what quantum neurology is and how it can heal. Plus, Dr. Nandi discusses brain-generated pain and how to overcome it.